Scuba diving can be an amazing experience. It gives you the chance to get up close and personal with the underwater world. However, there are several points of scuba diving safety it’s important to keep in mind. Some of these may seem obvious, but they’re all key in promoting successful dives while simultaneously steering you away from dangerous situations. While it may seem like a lot of information, make sure to review this list before each and every dive. While scuba diving can be fulfilling and awe-inspiring, it can also go awry very quickly if safety precautions are not properly observed. We’ve got 10 foolproof safety tips here to ensure you have a successful dive. Curious if there’s anything you’re missing? Read on to find out! There’s more to scuba diving than strapping on a wetsuit and an air tank and diving under the sea. Whether you’re new to diving or you’re a pro, it’s never a bad idea to review key elements of scuba diving safety. The number one rule of scuba diving safety is to make sure you’ve had proper training. To dive successfully, you’ll need to be both comfortable with the water and confident in your diving abilities. If you aren’t, that may be an indicator that it’s time to seek some more instruction. It takes some time to get used to being in the water. It’s a new environment, and finding your bearings isn’t always easy. However, proper training can help you find your sea legs and give you the confidence you need to dive successfully. A common mistake for new divers is that they forget to breathe. It’s an instinct: underwater, we’re used to holding our breath. However, in regards to scuba diving safety, this is a mistake. When it comes to scuba, holding your breath can lead to injuries and can even be fatal. When you’re diving, your lungs will expand during your ascent, but they’ll contract as you descend. This isn’t an issue if you continue to breathe during your dive, but if you hold your breath, there will be nowhere for the air to go as your lungs change size. This can lead to a rupture in your lungs, causing serious injury or worse. Luckily, this is very easy to avoid if you remember to continue to breathe throughout your dive. Sometimes, especially when we’re in a new environment, relaxing is something that’s easier said than done. When you’re new to diving, it’s easy to always be aloof and alert during your dives. This isn’t inherently a problem. Deep water provides new creatures and new challenges, and you’ll need to be ready at a moment’s notice. However, your mind and body won’t’ work as efficiently as they should if you aren’t relaxed. If you’re tense or overthinking, it’s very easy to make yourself panic. You can’t think of the water as a foreign body. You need to be comfortable in it! Take some time getting comfortable with the water, how it feels, how it looks, and progress from there. Keep in mind that it’s important to know your limits, and if you’re uncomfortable at any time, it’s okay to retreat to more familiar waters. Remember: there’s safety in numbers. Regardless of where you are, whether it’s a new location or you’ve been there several times, never dive alone. Diving with a buddy lets you have an extra pair of eyes. This is particularly helpful in new environments, or if you’re a new diver. As a matter of fact, you shouldn’t dive alone unless you are properly trained and certified. Several emergency situations require two people to handle them appropriately, which leaves you out of options if you’re alone and the unthinkable happens. Even the most experienced divers know that a major key to scuba diving safety is to use the buddy system. Regardless of your skill level, though, you should always be diving with a partner. Bring someone you trust to ensure the safety of both of you. If your equipment isn’t up to standard, then you’re violating a major factor of scuba diving safety. Your survival underwater depends on the functionality of your equipment. Don’t risk it just for the satisfaction of getting underwater quicker. The status of your equipment matters just as much as your technique and your training. If you’re underwater and your equipment malfunctions, it could mean serious injury or even death. Did you know that most scuba equipment malfunctions occur not because of an issue with the equipment itself, but because of user error? Make sure you understand your equipment and its functionality before putting it on and diving into the water. It could mean the difference between life and death. Remember that the atmosphere and air pressure changes between ascent and descent. You’ll want to make sure your dive is controlled and measured appropriately. Control is important to keep in mind in regards to scuba diving safety because a dive that’s too fast or too slow can cause you bodily harm. Remember that, during ascent, you shouldn’t move more than 30 feet per minute. Additionally, you should always take a safety rest for at least 3 minutes once you reach 15 feet. That doesn’t give you permission to speed up and burst through the surface at the end of your dive, however. The rest of your ascent should be made slowly and with the same control you kept on the way up. When it comes to scuba or any sport, particularly extreme ones, it’s easy to want to go in with guns blazing. Whether you’re a seasoned diver or new, or you just want to show off, one of the key factors in scuba diving safety is to remember your limits. It’s perfectly fine to have limits, and even beneficial. While you can’t really help getting in over your head (it’s scuba, after all! ), you can control the dive by only going as deep as you feel comfortable. The great thing about being underwater is that there’s always more to explore, meaning there’s always room to progress. Keep in mind that your limits don’t have to strictly be about the water itself. Pay attention to weather conditions, and study up on diving locations before you make the leap. If anything makes you uncomfortable or you aren’t prepared to dive that day, there’s no shame in rescheduling or canceling. Remember to keep yourself safe. Scuba diving is a physical activity, so it makes sense that you’ll need to be in decent physical shape to meet optimal scuba diving safety. Scuba is more than just swimming along in the deep water. You have to be able to carry heavy equipment for long periods, and your body needs to be strong enough to handle the pressure of deep water. Additionally, ascents and descents both require physical stamina. You’ll need to make sure that you’re in good shape in order to handle everything a dive demands of you. If you aren’t physically fit and attempt a dive, it could cause you to exert more energy. This means you’ll use up your air quicker, and could lead to a panic attack beneath the water. One of the key aspects of scuba diving safety is managing your air correctly. In a pinch, it can be the difference between making it to the surface successfully or the unthinkable alternative. There’s actually a simple formula to make it the most effective: use 1/3 of your air on the outward journey and 1/3 going back. You should keep that last 1/3 in your reserves in case something goes awry, or if you need more air than anticipated. While you may not need much in reserve, even to handle a safety stop, it’s important to keep any scuba buddies in mind. Make sure you have enough air to donate to your friends in a pinch. When it comes to diving in deep water, you can’t afford to make a single mistake. Just one slip up could result in panic, injury, or the unthinkable: a fatality. Whether you’re a seasoned, veteran diver or someone just out of training, make sure you’re carefully reviewing all of these points prior to your next dive. In the meantime, make sure you’re keeping your health in tip top shape and exercising whenever you’re able! You don’t want to wind up being unable to handle the depths and the equipment, right? 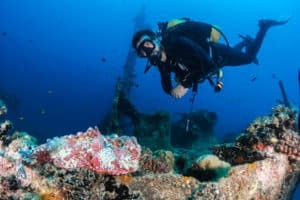 Most scuba diving accidents could have been prevented if the diver had observed proper scuba diving safety techniques. Don’t let a terrible accident befall you or your friends. Instead, make sure you have everything in order, regardless of how small it seems. Are there any key scuba diving safety tips that we forgot? Anything you think we should mention that isn’t on this list? Go ahead and drop us a line! We’d love to hear from you, veteran divers and new friends alike!